Dover Town Council: No extended sitting please! It surfaced last week that Dover Town Council has a new agenda: to stop "extended sitting". For those delinquents among you who have engaged in such a perilous pastime, I need not explain the dangers of 'lounging' and the 'antisocial behaviour' it can cause. 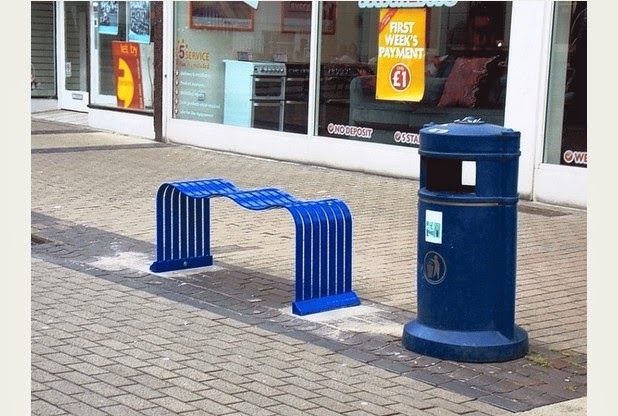 So, forget the teenagers pulling 50mph in their Corsas down the high street and the Saturday night drunk-and-disorderlys in town because the real priority in Dover is to deter the kind of pesky people who insist on sitting on benches. Not just sitting, but sitting for an extended period of time. The cheek! But on a more serious note, the new benches are obviously going to prejudice many groups, like the elderly, mothers with children and those in poor health, who surely have legitimate reasons for taking a little break when out and about. However, the thinly veiled 'extended sitting' clearly refers to one kind of person that Dover are trying to deter from sitting in the town centre; those without a space to occupy during the day, or indeed those who live and sleep on the streets. The local paper, The Dover Express, reveals the true motives of the project with an foolish councillor admitting that the benches have been installed to 'stop the alkies'. This ill-informed and ignorant stereotype represents the unreliable foundations of any council who would pursue such a ridiculous idea. If Dover does genuinely feel there is a problem with people lacking something positive to pursue during their days, a better policy would be to address issues of unemployment, homelessness and, if appropriate, alcohol addiction. Instead, their 'bubble benches' are a pathetic attempt to try and push vulnerable people from public visibility. So, any frequenters of Dover, normal rules apply; if you see a bench, don't even think about it! Kwame published on Huff Post!